ANAHEIM, Calif., January. 11, 2008 – iForged Performance Alloys becomes the first wheel manufacture in the world to release a 22" wheel application for the new Nissan Skyline GTR. 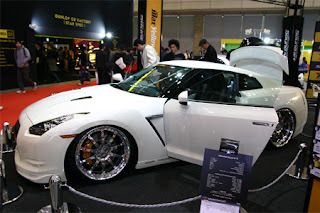 Two Skyline GTR's showcased the new 22" wheel fitment at the 2008 Tokyo Auto Salon. The Skyline GTR custom wheel fitment was a collaboration effort with Nissan Motors, Brembo Japan, Auto Technik Japan, and iForged Performance Alloys.